Dr. Rob Presley attended Mississippi State University for his undergraduate degree in animal science. He also received his veterinary degree from Mississippi State in 2004. After graduation, Dr. Presley performed a small animal internship and internal medicine residency at Auburn University. 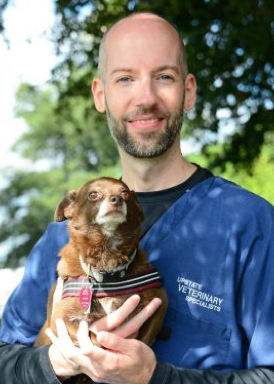 After becoming boarded in internal medicine in 2008, he joined the team at Upstate Vet. Dr. Presley’s clinical interests include minimally invasive procedures and pre-hospital medicine. Every Wednesday, Dr. Presley donates his time providing K9 officer handlers first-aid courses that include basic physiology, CPR, tactical emergent casualty care (TECC), and heat injury prevention. He also helped develop and raise funds for life-saving first-aid kits that can be used on both handler and dog. Outside of work, Dr. Presley enjoys golfing, woodworking, and spending time with his wife, Ashli.